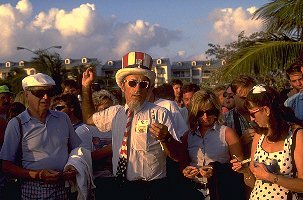 Key West, North America's most eclectic town, called by long-time residents "the end of the road," is the gathering place for the homeless with an artistic bend, musicians, millionaires, tipplers, treasure hunters and thousands of mobile middle-aged singles who take a stab at the town for a few months. Located 130 miles off the coast of Florida, closer to Cuba than to Miami, and the southernmost town in the United States, Key West has a mind boggling sense of freedom and let live. Most Keywesters think of themselves as artists or free spirits who enjoy art and the Bohemian lifestyle. In place of a movie script in their back pockets, ala Hollywood, Keywesters will whip out their paintbrush and sculpture knife. The little town is a dream fulfilled for the burned out Boston stock broker who once dabbled in oils on weekends between conference calls. It is a way of life for the street person who sells one-of- a-kind jewelry, handmade in the back of his van, and a second beginning for many, who never dreamed they would be walking around Key West in sandals and shorts, drinking rum coolers in sidewalk cafes while living off the pension check. Papa Hemingway moved in during the mid-30s followed by everyone from Wallace Stevens, Tennessee Williams, John Dos Passos and James Leo Herlihy. The last bastion of '60s hippies are hanging on by their ponytails and look down on the current batch of hippies who are reduced to braiding hair on the sidewalks and have "no purpose in life" other than begging for coins. Regardless of your station in life, for most, Key West is love at first sight. During the 1970's a large influx of East Coast gays reversed the character of a faded town by opening quality restaurants, art galleries and meticulously restoring historic buildings. 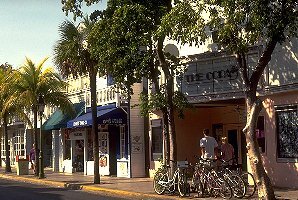 Key West was also the first city to elect an openly gay mayor. The character of the town can stretch the imagination. Where else in the United States will you find pink taxi cabs dodging bicycles, local dogs chewing on coconuts as if they are lamb chops du Francais, and a nightly sunset ritual. Dogs have their own exercise beach named, what else, Dog Beach, even though felines rule the territory. There are hundreds of cats strutting about, many of them six-toed offsprings from Ernest Hemingway's beloved brood. For good measure, Keywesters also walk on green lights (no cop, no stop), love to disagree with the authorities and have a street juggler with a pet pig. The high school sporting teams are called the "Fighting Conchs," pronounced conks. The female cheerleaders are Conchetts. The official town greeter, who claims his real name is Love 22, dresses in an Uncle Sam outfit and passes out bogus $22 dollar bills sporting his picture. Popcorn Bennett, who sells popcorn, ran for City Council and made it a close race. Duval, a main street that stretches from the Gulf to the Atlantic ocean, is jammed with museums, historic buildings, restaurants, bars, live music, and enough t-shirt shops to dress an army. Duval is always crowded with pedestrians, bicycles, open-air trolley bus tours and folks walking around with everything from parrots to lizards perched on their tanned shoulders. "Go with the flow and smile, and you'll be okay," quipped a man selling art on the streets, as a brightly painted van slowly drives by with a large sign reading "Carpenter For Hire." "Did you notice the sign "Key West International Airport" the man asked? This is because we once had a flight from Key West to Cuba. Pilots say the sign is eight feet longer than the runway." 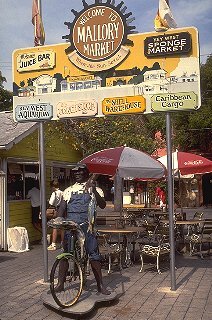 For all the zaniness, the other side of Key West can be experienced on a Nature Bicycle Tour through the back streets and paths of Old Town led by transplanted Lloyd Mager. (305) 294-1882. We cycle by a brightly painted house owned by a Conch. Mager explains that a Conch is a unique blend of Bahamians, West Indians and Cubans whose relatives brought to Key West their love for conch chowder and fritters. The town's pride can be seen in the architecture and the unusual "eyebrow cottages" named for the overhang roof which shades part of the windows. Reportedly there are only 18 two-story eyebrows in the world, and they are all in Key West. Many of the houses were moved intact in the 1930's by barges from the Bahamas and Cuba while others were built by the ship's carpenters. We learn that many of the street paving stones came from the ship's ballast when pirates controlled the island. We pump past a small mamma-papa Cuban restaurant where black beans are simmering in the skillet, see exotic flora and sample freshly picked fruits in the cemetery near B.P. Robert's stone which reads, "I told you I was sick." 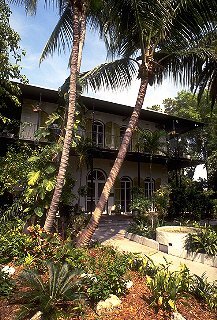 A Key West tradition is the do-it-yourself walking tours of the historic homes on the museum trail which include the Audubon House & Gardens, the Key West Lighthouse Museum, the Harry S. Truman Little White House, the Heritage House & Robert Frost Cottage, the Wreckers's Museum House and Ernest Hemingway's House. Most are registered Historic Landmarks and conveniently near one another on the one and one-half mile long, four mile wide island. The Wreckers' Museum House, circa 1829, the oldest house in Key West, reflects the influence of the early ship builders. Hundreds of ships sunk off Key West, many of them blown onto coral reefs in devastating storms. Salvagers became rich from the booty, as did Mel Fisher, who discovered millions of dollars of Spanish New World gold, silver and jewelry now housed in the Mel Fisher Maritime Heritage Society Museum on Greene Street. The one-acre Ernest Hemingway Home and Museum feels as if he is still in residence and should be working in his second story study where he wrote some of his greatest novels and short stories. He lived here from 1931 to 1941 with his second wife Pauline and two sons. The house is intact with original furnishings including 56 cats, most descendants from Hemingway's time. Another gem is the Gardens Hotel in Old Town, opened in late 1993 and designed around a tropical botanical garden with tinkling gardens, banyan trees, blooming flowers, a large swimming pool, and four one-ton earthenware jars used by Spanish settlers to catch rainwater for drinking. Owners Bill and Corinna Hettinger purchased the private residence on almost one-quarter of an Old Town city block, and in the style of a small, luxury, European hotel, have 17 rooms including two suites, Italian marble, original art in each room and imported furniture from England. Worthy of the rich and famous, the hotel offers Nina Ricci toiletries, fluffy robes, a complimentary continental breakfast and enough romantic ambience to keep honeymooners blissful for a month. 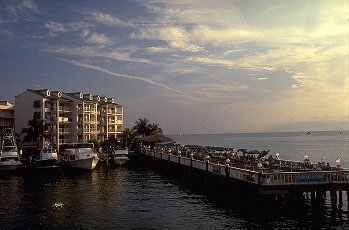 After a swim at the hotel, guests can walk to Mallory Square on the docks for the nightly sunset glow. John Starr, a former bank consultant, is performing the Stupid Egg Trick, Dennis Riley is playing his bagpipes and Dominique is directing his pure white house cats to jump through hoops. A man is juggling match sticks on his nose as the sun dips in a flame of orange. The Cookie Lady on her bike is selling her popular homemade cookies and sings, "Don't be uptight come and try a bite. Thanks for the five it keeps me alive." A boat sails by with a large banner reading "Peggy will you marry me? Love Mike." Suddenly from the pier Peggy yells, "yes!" Everyone cheers. IF YOU GO Contact the Gardens Hotel at 526 Angela Street, Key West, FL 33040. (800) 526-2664; (305) 294-2661; The Greater Key West Chamber of Commerce at (800) LAST-KEY.